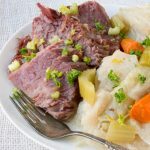 This Low Carb Keto Corned Beef and Cabbage is made quickly in the Instant Pot or slow cooked in the Crock Pot with directions for both! 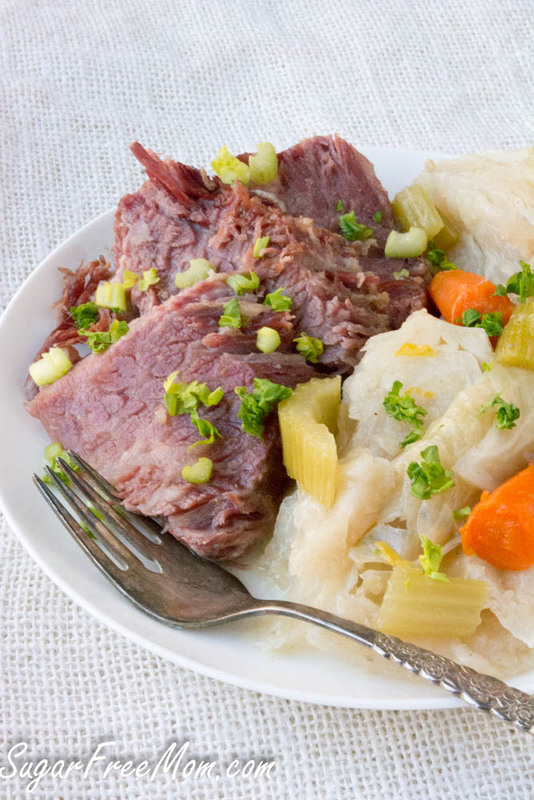 Whether you are Irish or not, when St.Patrick’s day comes around during the month of March, Corned Beef and Cabbage can be found in abundance in all supermarkets. 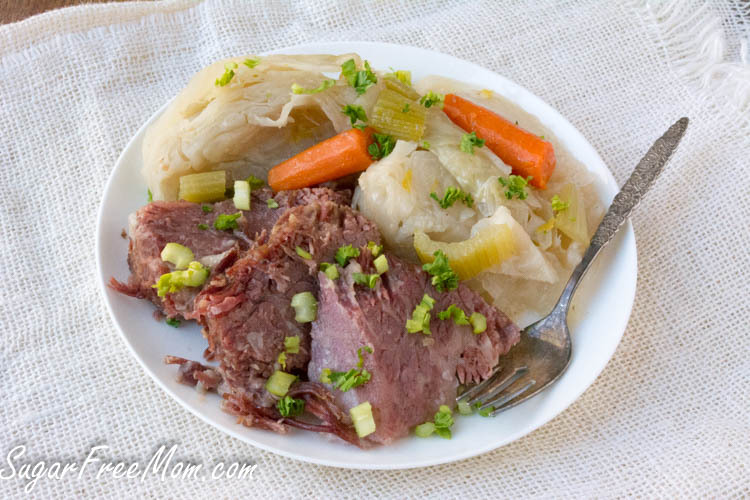 Being Italian we never ate corned beef and cabbage, but once I met my husband and married 19 years ago, it was a must for him and I fell in love with this tasty beef brisket. 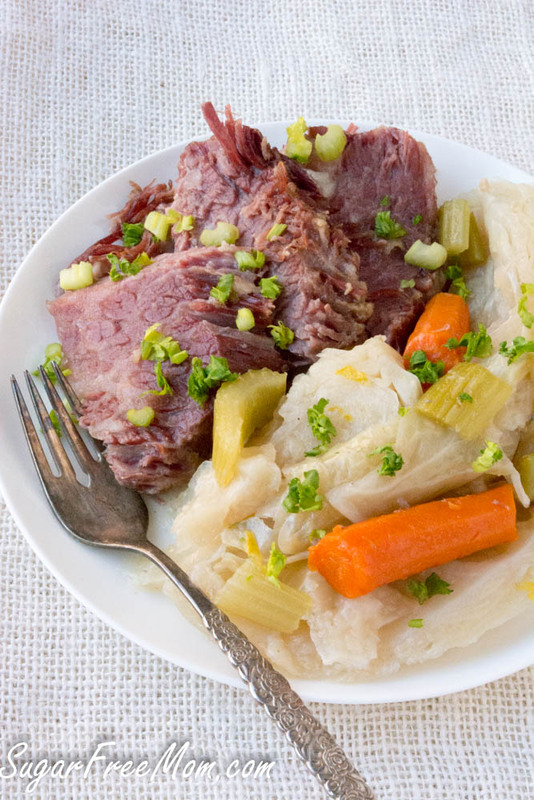 This classic recipe for St.Patrick’s day just needed a little tweak to make it lower in carbs. 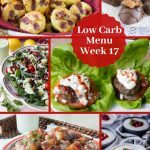 Just by removing the potatoes typically in this recipe, it lowers the carbs significantly. Of course if carbs are not a problem for you, just add them back into the veggies I’ve used here. Even my kids who aren’t too keen on boiled veggies enjoy eating this, of course they prefer a larger portion of the beef as opposed to the veggies, but it’s all good to me. 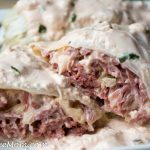 But my kids do also love my Reuben Cabbage Rolls and Reuben Calzone! 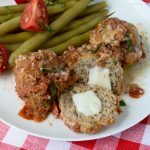 Add some Irish Soda Bread or Irish Soda Muffins to make these meal even better! 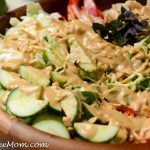 Some of you may not have an Instant Pot and that is certainly fine as I’ve provided directions for making this in a crock pot as well. 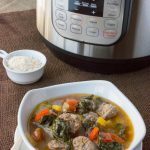 Both taste equally delicious, but the Instant Pot cuts the cooking time down by half if you were making this on the stove top. Whichever method you choose to use to cook this scrumptious meal, I’m sure you won’t have any complaints from the family. 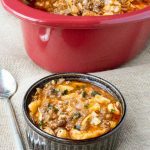 It’s tasty and comforting! Even my picky hubby who is a meat and potatoes man but recently is eating lower carb, didn’t complain there were no potatoes in this. That is a little miracle to me to be honest with you! Place beef brisket into the pot. Discard the spice packet that comes with the meat. Cover the beef with water, add more to cover if needed. Add the spices into the pot. Cover and set on "Meat/Stew" for 60 minutes on high. Hit Cancel then use the Natural Release method, about 20 minutes. Remove cover carefully, watch for steam, remove brisket and keep warm. Add the vegetables to the pot and press "Soup" setting for 15 minutes. Use the "Quick" Release method. Uncover and add the beef back to the pot to warm through. Add all ingredients into the crock pot except the cabbage. Make sure the meat is fat side up. Cook on low 6 hours or until vegetables are tender. In the last hour add the cabbage. 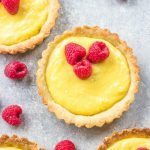 This recipe was first published in March 2016 and updated with video in March 2019. I’ve been subbing rutabagas for potatoes. Lower carbs, my husband can’t tell the difference. I was just going to see if anyone had suggested turnips instead of potatoes. I have a problem with rutabaga spiking my blood sugar but turnips are usually ok, so I’m going to give that a shot. Got to add them at the right time, though, so they don’t turn to mush. I might even consider roasting them and adding them at the end of cooking the brisket. Thanks for the recipe! Love your site! I have started using Jerusalem Artichokes fro potatoes. 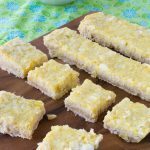 They are a great alternative and are low carb. It you can’t find them for sale, they are super easy to grow in a pot, bucket or anything. But Turnips are a great alternative as well and I like them better than potatoes. Im guessing there is no need for broth or anything of that sort because everything else combined is gonna make it’s own broth and flavor for the meats and veggies, yeah? right, the water added is enough and the spices used. I often substitute broth when recipe calls for water. Simply use either beef, chicken or vegetable broth as appropriate to the recipe. Your recipe is excellent! I had this for lunch today. But paired with a side of roasted cabbage instead cooked with avocado oil and seasoned with salt and pepper. Thanks for sharing. So glad you liked it thanks! 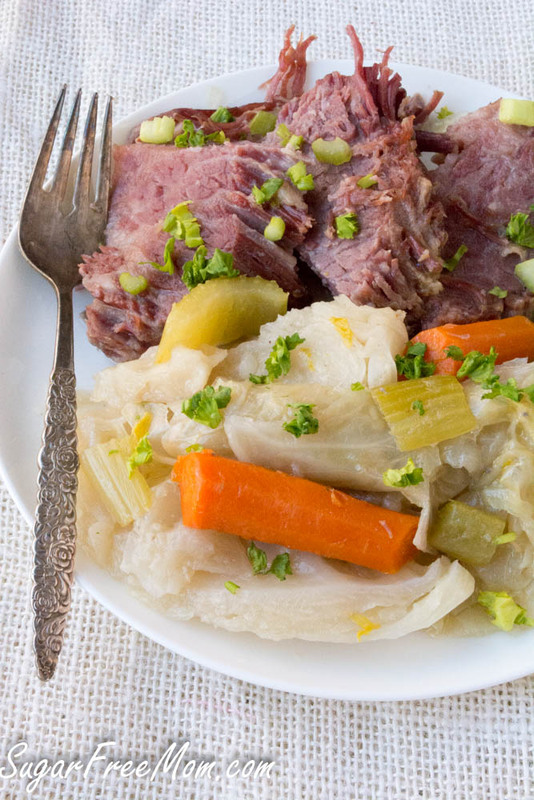 Do you know where you can find corned beef that doesn’t include sugar? I’ll try your recipe this week! I’d figured to use chunks of turnips instead of potatoes. Parsnips sound like a good option, but I don’t see them often in the market. I just now thought golden beetroot would be a good pairing…not red!!! Have a great, healthy, St. Patrick’s Day! Where do you live that your Costco has Grassfed GF Corned Beef?!? 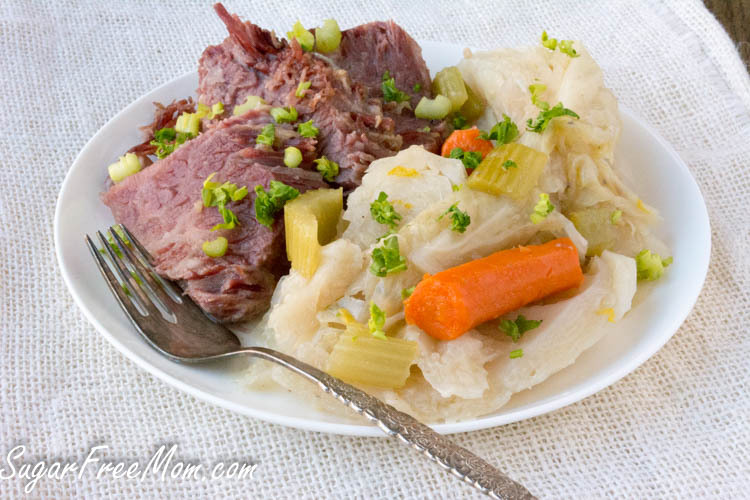 My corned beef is in the instant pot! Curious: final nutritional info says serving size is 5.5g….what is that supposed to be? 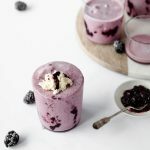 my recipe plug in had a glitch. Should be 5.5 ounces. 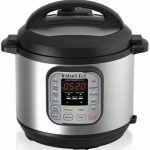 What size Instant Pot do you use for this? Is the 6-quart large enough for four pounds of meat plus a head of cabbage and all the other ingredients? just curious, why do we disregard the spice packet that comes with it? It’s usually full of sugar. I can’t seem to find the directions for slow cooker. Where may I find it? Otherwise, I’ll try recipe ingredients and guess for the cooking time in crock pot. I highly suggest a low, slow roast of meat and when done a high roast of veggies! You will never boil again!! How do you do the roast? In the instapot? Do I still need to use 6 cups of water in the crock pot? Maybe not, as long as your corned beef is covered for the most part. Do you put the radishes in at the same time with the other veggies (excluding the cabbage)? Instant Pot time was way off. Need to put it in more like 1:30, then let natural release fully. I missed adding in the release time. All set now. On Green Day, I will take Shepherds pie instead. Right under the ingredients are the directions then the slow cooker directions. I made this in my instant pot, the meat was delicious, but the veggies are extrememly mushy and probably could have done with half the cook time. I’m not sure if that is how you like your veggies, but maybe add an edit so that those of us who prefer a slightly more al dente veg can adjust our cook time?